Thought home technology was limited to TV and audio? Cat owners, in particular, might like to think again. They will know that any open door or window is fair game with a determined pet, but the best smart cat flaps can do a whole lot more than just let puss in and out of the house, they can significantly add to your peace of mind and, if your cat doesn’t respond well to the presence of other animals, to theirs as well. Check out our buying guide to find the best smart cat flap to suit your style and budget. Then, find more smart home technology on our dedicated hub page. Our best microchip cat flap is the original Sureflap – it can register the identification microchips of up to 32 cats, but it’s just as highly rated for households with only one or a handful of kitties thanks to its easy installation and four-way lock, which makes it extra-secure against potential intruders. Looking for something a little more complicated still? If you have kittens you don’t want following the older cats outside just yet, or cats who’ve recently been in a scrap and who you’d rather keep inside for a bit, take a look at one of our picks with a timer, special Curfew Mode or adaptable exit permissions. The original Sureflap can recognise the nine, 10 or 15 digit microchip numbers of up to 32 cats – or simple collar RFID tags, if they’re not chipped – makes it a great addition to catteries or cat-sitters’ abodes, but the peace of mind it offers makes it the most popular cat flap with all sorts of households. With the press of a button, it learns your cat’s chip number when they next saunter by, and testers found it just as easy to install in wooden, PVC or glass doors, as well as being reassured by the four-way lock that keeps strays out even while your cat is coming and going. Cat owners commended the PetPorte from PetSafe for its ease of installation in even glass doors, and found that syncing their cats’ microchips was straightforward, but as that’s reasonably par for the course when it comes to smart cat flaps, it’s certainly worth mentioning the PetPorte’s particular charms. There's a pretty advanced timer function that you can program to lock and unlock at set times of the day, and even a night mode that detects light levels and locks when it gets dark, perfect for cats who stay indoors at night and whose owners don’t want to faff around taking daylight savings into account. On first examination, the Sureflap DualScan is hardly distinguishable from the original Sureflap in our number one spot, and it actually boasts most of the same charms: a 32-cat memory, easy mounting even in glass doors with the use of the included mounting adapter, quick microchip learning function and four-way lock, to be precise. The one vital difference lies in the ‘DualScan’ part which may make it worth the extra outlay. This enables you to set different permissions for different pets as well as time limits, so younger cats can spend increasing amounts of time outdoors, or small dogs who also use the flap can be kept from going outdoors at night, for example. 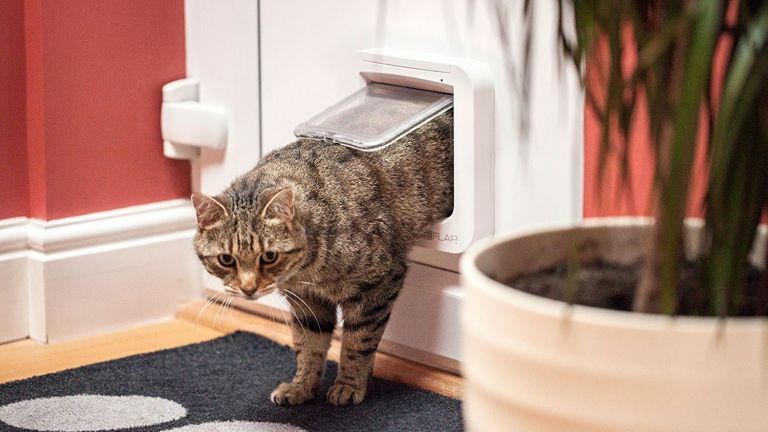 With a learning capacity for a whopping 40 microchips, this PetSafe cat flap has easily the biggest memory of any cat flap on our list, and is therefore among the best options for cat shelters and boarding catteries. In fact, it’s tops for any house where cats frequently come and go, as it’s designed with energy efficiency in mind, with a built-in draught excluder and two magnetic closing locking points to increase insulation. It also has dual auto-locks in addition to a four-way manual lock, making it an extra-secure option for those particularly worried about intruding wildlife or stray cats. Yet another close relation of the original SureFlap, this microchip pet door, perhaps unsurprisingly, is also in possession of a 32-cat memory and secure, long-lasting construction. Its big differences are twofold: first, its size, which allows small dogs as well as larger kitties to use the door, while the microchip functionality ensures larger creatures like foxes are still kept out. It also swaps the separate permissions of the Sureflap DualScan for Curfew Mode, a built-in timer which programmes the door to lock and unlock at times set by you, so if you’d rather your pets didn’t go a-wandering while you’re asleep, this is a great way to ensure they stay safe. Looking for more smart home buying guides?